Join European royalty in the cradle of Alpine skiing. Lech and Zürs offer a great exquisite outdoor experience in breathtaking Alpine setting. Perfect for families and couples, the twin resorts of Lech and Zürs share an uncompromising commitment to quality. 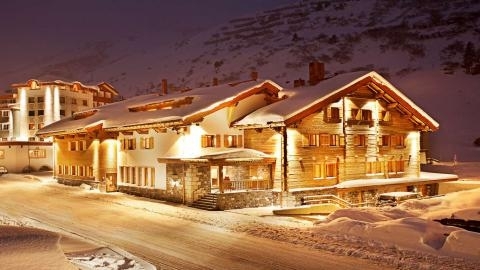 The predominantly wealthy clientele can enjoy refined high life during their stay in a luxury ski chalet or hotel. In the year 2004 Zurs won the Entente Florale and is pround that it can name itself "most beautiful village of Europe 2004". Zürs was a tiny hamlet used only only for farming during the summer until (in the late 1890s) the Flexen Pass road was built and Zürs began to develop, entering the wintersports scene in the early 20th century. One of the best ski areas of the world is situated in Austria, at the Arlberg at an altitude from 1300 to 2811 metres. The Arblerg is not a mountain but rather a mountain pass of the Alps connecting the federal Austrian states of Tirol and Vorarlberg. Winter athletes will only need one ski pass for the whole skiing area – the Arlberg-Card gives them access to a snow paradise with more than 80 inclines and lifts, 276 kilometres of slopes and 180 kilometres of deep snow runs. Known as Lech's "little sister", Zürs is the higher "heaven" of the Arlberg skiing paradise. At 1724 m above sea level the peaceful alpine village assures the serenity of snow white winter till late April. Zürs was first built for the special purpose of a luxury skiing resort, but it has though preserved the traditional Austrian charm of the cozy mountain atmosphere and hospitable welcoming. Zürs and Lech form the core of one of the best skiing areas - Arlbeg region. Arlberg also includes the resorts of St. Anton and Sonnenkopf within short distance and great skiing and entertainment opportunities. The different parts of the Arlberg skiing area are interconnected by a modern lift system and regular bus network, so coming up to peaceful Zürs you can profit all within reach. Zürs welcomes skiers of all abilities and interests. Experts will find great variety of advanced and difficult runs to conquer. Very famous is "Der Weiße Ring" a ski tour, which runs through Lech, Zürs, Zug and Oberlech. Ski Arlberg provides an unparalleled skiing experience with a total of 87 cable cars and lifts, 305 kilometres of ski runs and 200 kilometres of high Alpine deep powder snow runs. There are plenty of ski huts & mountain restaurants. The self-service restaurant Salome not only offers delicate provisions for your daily ski trip, but, from its perfect location, also provides an amazing 360 degree panoramic view of the Arlberg mountain world. You should have a rest in the Panoramarestaurant Rüfikopf, Schneggarei ski hut or Restaurant Seekopf, which awaits you with daily fresh, delightful and traditional dishes.